Designers want their end results to be loved and used! It isn’t enough to make a place look great or have the latest in sustainable features. What creates a vibrant public place? Beautiful spaces with rich detailing draw people into a place. But what keeps them coming back? It is often the interactions that take place in a park and the sense of ownership that keeps people coming back. A beloved site takes on life beyond what was anticipated during design. As humans, when we feel a connection, we want to be involved in a place. When a group has this attachment to a park, a street end, or an open space and then maintains it or plans activities there, it is a lovely outcome to the design process. We can provide a design that incorporates the elements a community requests during the public process; but attachment cannot be designed. A designer can only provide the foundation for connections. The sites we work with are not static. The day construction finishes is only day one in the life of the design. Like living things, public spaces need care and upkeep. The intent is that communities and or special interest groups take ownership of the places we’ve worked on and help the spaces evolve and thrive. This public stewardship makes for lasting, beloved places. 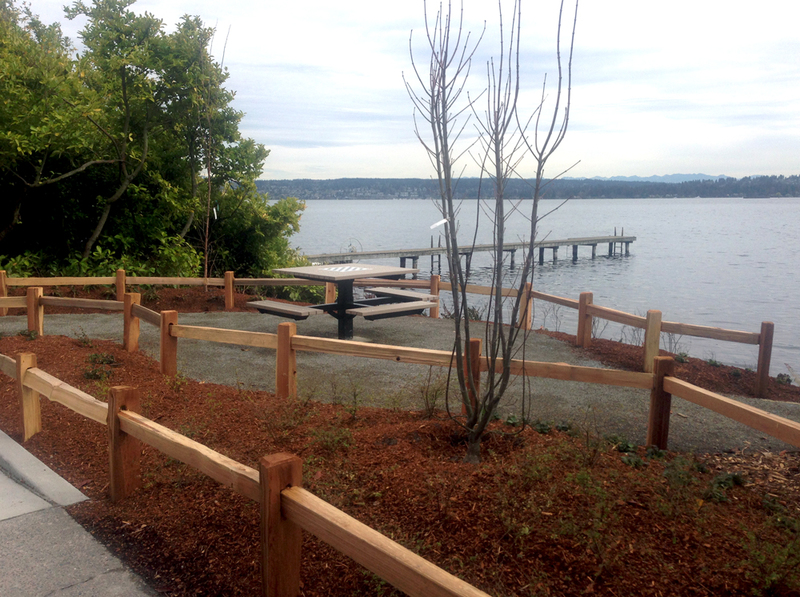 The Salmon Bay Natural Area overlook is an example of community effort resulting in a loved space. Groundswell NW led the effort to preserve the wooded bank along the Salmon Bay waterway. The viewpoint gives views and educational opportunities while native plants help buffer the parking lot and enhance habitat. In addition to conducting the design process for this site, Groundswell NW still organizes work parties to maintain the habitat and preserve the work done during installation. During design we structured the site design so that an art piece could be added at a later date. 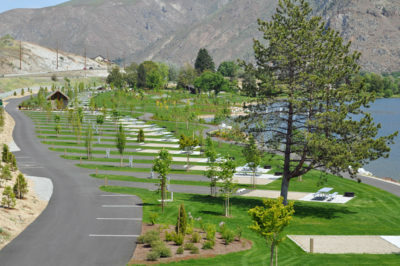 The community came together to add an art element after construction of the overlook. Groundswell NW hired artist Marvin Oliver to create the Salish Welcome sculpture honoring the salmon and local indigenous cultures, creating a signature focal point for the site. 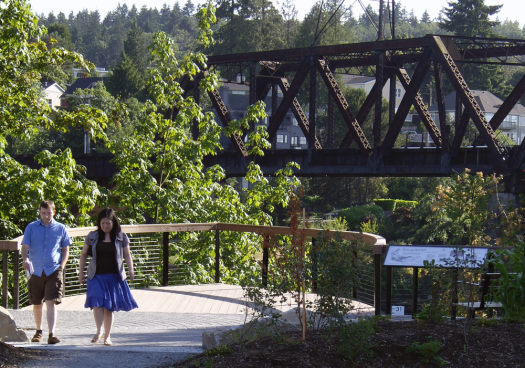 The figure is eye-catching from the Burke-Gilman trail and draws people down to the site to enjoy the view or to learn about restoration efforts. The commitment of the Friends of 19th and Madison group to the future Cayton Corner Park is an example of community taking ownership and creating a new public space in a dense urban environment. The park springs from the desire of the neighborhood to make a park from a vacant lot. 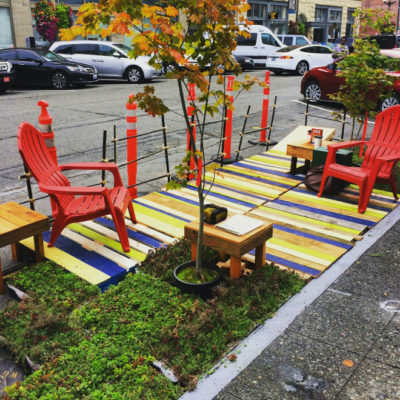 The Friends pursued Department of Neighborhood grants to fund the design for new Seattle park space that will become a living room for this part of the Central District. 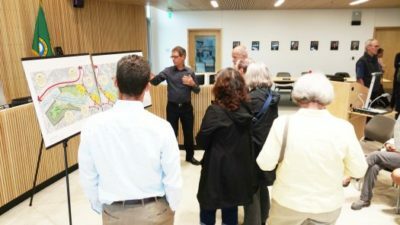 Even before the park’s development, neighbors are making connections to the place and to each other. Chalkboard paint on an existing wall, a little library, and regular cleanup days are all evidence of care. 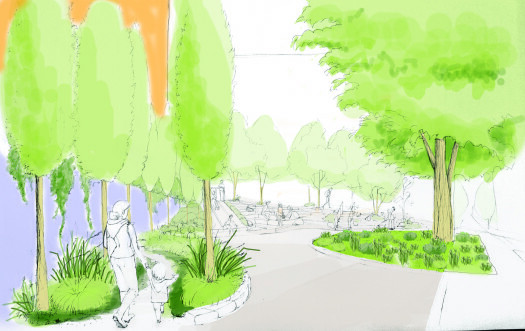 Through future park elements like amphitheater steps, an embankment slide, musical play, and a sensory garden, an open space will be created that serves as a signature space for the neighborhood.